In the last tutorial we discussed for loop. In this tutorial we will discuss while loop. As discussed earlier, loops are used for executing a block of program statements repeatedly until the given loop condition returns false. 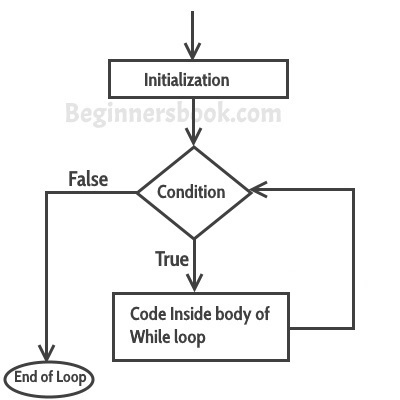 In while loop, condition is evaluated first and if it returns true then the statements inside while loop execute, this happens repeatedly until the condition returns false. When condition returns false, the control comes out of loop and jumps to the next statement in the program after while loop. A while loop that never stops is said to be the infinite while loop, when we give the condition in such a way so that it never returns false, then the loops becomes infinite and repeats itself indefinitely. This loop would never end as I’m decrementing the value of i which is 1 so the condition i<=6 would never return false.